It’s that time of year again! The 2018 MGBH Permit is now available for purchase online, or at Canada Post outlets and select independent vendors across Canada. WHC wants to recognize and remind our supporters of the incredible impact they have when they purchase their Conservation Stamp. 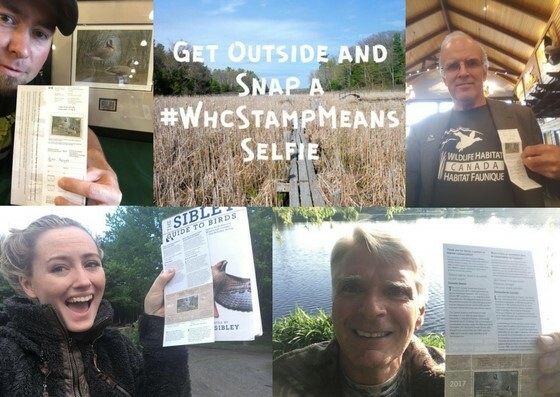 We are encouraging our followers to share their stories on social media and snap a selfie with the 2018 WHC Stamp and tell us what the Stamp means to them. If you use the hashtag #WHCStampMeans you’ll be entered to win great prizes! When a Stamp is purchased, either as part of the MGBH Permit or for philately collector purposes, the funds are directed to WHC to support conservation and stewardship efforts across Canada. Since the Program’s inception in 1985, WHC has invested over $55M to conservation projects across Canada. To find out more click here. Thank you for your support and for participating in our social media campaign.